Exploration. What does that even mean in a time when everything has been Google-mapped? Maybe it’s as simple as getting out of your own headspace and challenging yourself in some less familiar game, eschewing the comforts of the routine. And so you enter the Wilderness. And what a place! Powerfully flowing rivers, vast mountains, glaciers, large animals, bush planes: Alaska. Dramatic weather changes favor the well prepared. The endless summertime daylight encourages movement. An inspirational landscape matched by the lore of the many rugged individuals who have gone before. An opportunity to get off the grid and truly stretch your legs. A year prior, I came to this place with Michael Vienne on a scouting trip. Seeking routes and identifying what is required to comfortably disappear for a time. We encountered mid-August temperatures as low as 39 degrees and six straight days of driving rain that turned every track into a slimy river of mud. We never saw McKinley, as its 29,000-foot summit was constantly hidden by the clouds. It was a grueling rental bike marathon, but plans were laid and the course was set. 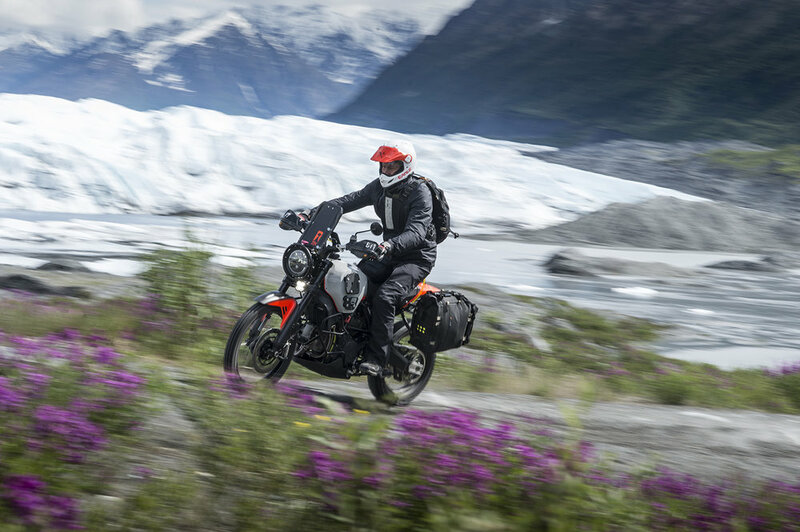 Returning to my temporary shop space in California, I began to strip down the Ducati Desert Sled that would be transformed into the “Alaskan.” A very simple and robust machine that proved a worthy foundation for the concept. The great distances between fuel stops demanded increased range, so I set about hand-forming larger tanks. The broken terrain demanded taller, super-aggressive tires. The anticipated rock strikes and inevitable get-offs required skid plate and crash bars, and so on. Months of late-night flogging followed by ridiculously limited testing, and the thing was done. Shipped, unproven, to Anchorage. Dan Trotti, Chris Thoms, Boyd Jaynes, Nathon Verdugo, Robie Michelin and I converged and collected our bikes. Not one of us has a great deal of experience off-road with fully loaded bikes. And my bike has never before been completely outfitted. It’s all strapped down. New waterproof riding gear zippered up, and we are off. It’s not until an hour of riding has passed that I start to shed the normalcy and thrill at what is to come. A few hours later we are on a glacier. The beautifully marbled, glowing ice is compelling, and I am euphoric like a dog let off the leash, hopping across floating ice blocks. The team scatters across the flow. Chris expertly pilots a drone above the team as we cross a deep gorge. Quietly capturing the expanse and just how small we are within it. This new tool reveals weather beyond our earthbound line of sight. Unlike the previous year, the weather is ideal. Never any real sense of menace. Raining only long enough to produce a spirit-lifting rainbow. Combined with the endless daylight, you quickly lose all sense of time. You ride longer, eat later and drink a lot of beer. It doesn’t take long to revert to being a limitless, feral animal. Sitting cross-legged in the dirt, well provisioned and happy — grateful for the wall of campfire smoke that is keeping the mosquitos at bay. 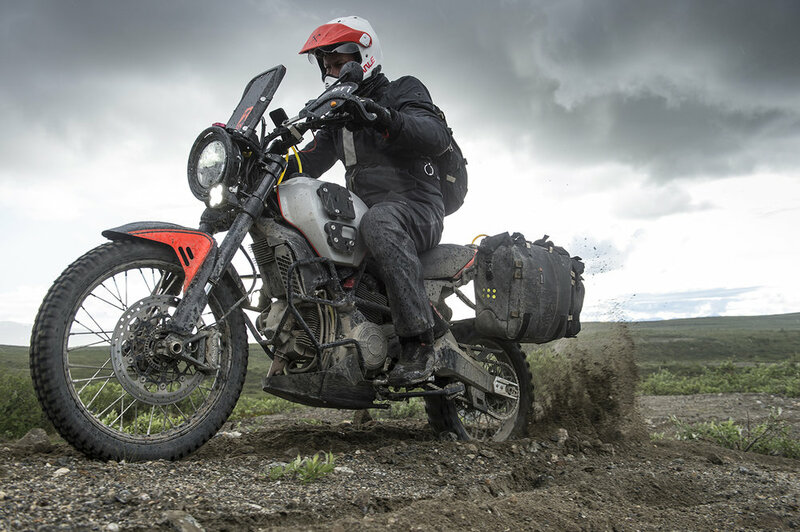 Day Two, and Nathon is wheelying my fully loaded Alaskan through a massive puddle for the camera. Looks fantastic splashing past at speed. The bike is resplendent covered in mud and finally has some trail cred. I am elated! It’s holding up to some serious abuse and sounds great. Very comfortable, but still raw enough. I don’t wish to be isolated from the elements — I want to master them. As luck would have it, Nathon’s mom, Kathie, was spending the summer in a camp near Denali National Park. Kathie is an accomplished rider herself who could certainly still outride any one of us. I’ll never forget how disappointed she looked while inspecting the tracks we left in the mud leading to our camp. “I don’t see any roost! ?” She hooked us up with cabins, hot showers and a chance to make some required repairs to the bikes. My bike was suffering from a split fuel line. Replaced and rerouted, we carried on. The next destination was Manley Hot Springs to the north. Of course, we already had been experiencing mosquitos, but in this place they were truly outstanding. So many mosquitos. We beat a hasty retreat into the surreal tropical greenhouse enclosing Japanese-style tubs of naturally heated water. Amazing. Refreshed, we spent the night drinking at the bar, while helicopter flight crews kept watch on a nearby forest fire, before returning to our tents. We arrived just in time to watch an immense moose and her three calves swim across a slough and clamber up the bank on the far side. It was at about this point that I lost all track of time. We headed south towards Talkeetna and Petersville Mining Road. Dan was occasionally trying his luck with the fishing reel. Robie was on a mission to ride every singletrack bypass, and Boyd tirelessly captured images of everything. We established camp on a hilltop surrounded by low, vibrant green shrubs with Mount McKinley looming high in its own atmosphere to our north. This place was heaven. No deadlines or reception. We were in the middle of a network of mine access roads, river crossings, mud and snow. This is where I fully realized the capabilities of the bike I had conceived and assembled for this very purpose. We spent days just exploring various tracks, and I grew to appreciate the machine. Not merely as a motorcycle, but as a conveyance that affords us an experience such as this. It does not shield us from the elements, but rather plunges us more deeply into them.